Ready to take your game night to the next level? Introducing Watch Ya’ Mouth THROWDOWN Edition! 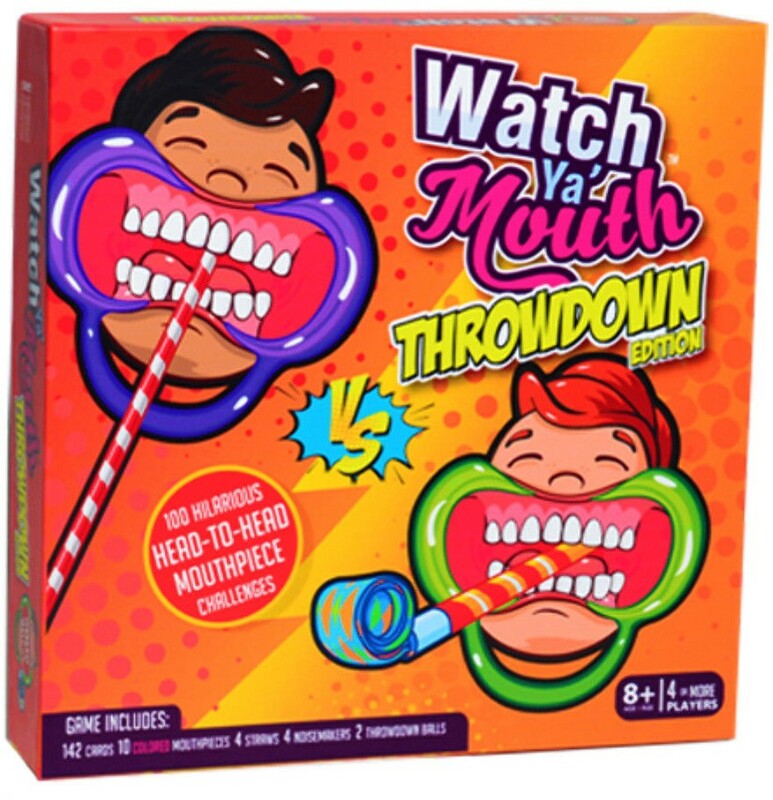 Includes 100 throwdown cards, 42 phrase cards (ages 8+), 10 multicolored mouthpieces (6 regular and 4 small), 4 straws, 4 noisemakers, 2 balls, 1 dice, and 1 sand timer. BOOM! Watch Ya’ Mouth Throwdown Edition amps up mouthguard gameplay more notches than you and your friends’ belts combined. Our head-to-head mouthpiece THROWDOWNS (challenges) are lit and legit. Throwdown Edition fuses the signature silliness of the original Watch Ya’ Mouth Game with spanking-new, side-splitting tasks and surprises. With Watch Ya’ Mouth Throwdown Edition, 4-10 players face off in our mouthy mashup of all your favorite bar games, relay race activities, and acting, singing, and drawing throwdowns —with some social media twists. One round of 4 people lasts 30-60 minutes and only uses 16 out of 100 THROWDOWN cards. Because there’s nothing more annoying than blasting through a pack of cards in one night (or) actually having to talk to your friends. The Watch Ya’ Mouth line of team-based card games is outrageously fun, but sometimes mouthguard gamers wanna get physical and refuse to share the glory. Thanks to our Throwdown Dice, your opponent changes every turn, so you can take down all of your peeps one by one. The better you know your buddies, the more you can destroy them. Don’t forget to record their humiliation and get Watch Ya’ famous! Gloat over your victories using #WatchYaMouth. That one friend’s uber-competitive meltdown, brought to you by Watch Ya’ Mouth. Every group’s got one. If you don’t think yours does, then it’s you, boo. But don’t worry. We heart you anyway.